Visit the traditional heart of Japan on your way to the ski fields, like the picturesque village Oshino Hakkai. Fancy swapping your swimmers for a ski jacket or snowboard this summer holiday? Hidden in the majestic Northern Alps in Nagano Prefecture, Hakuba is one of Japan’s top snow resort destinations with a long-standing reputation since 1928 for high levels of snowfall and unrivalled fine powder. It’s no wonder it was chosen as the site of the 1998 Winter Olympics. Unlike renowned Niseko snow resort, which is fairly Westernised, Hakuba still holds onto its Japanese traditional roots allowing you to also experience the culture, history and hospitality. 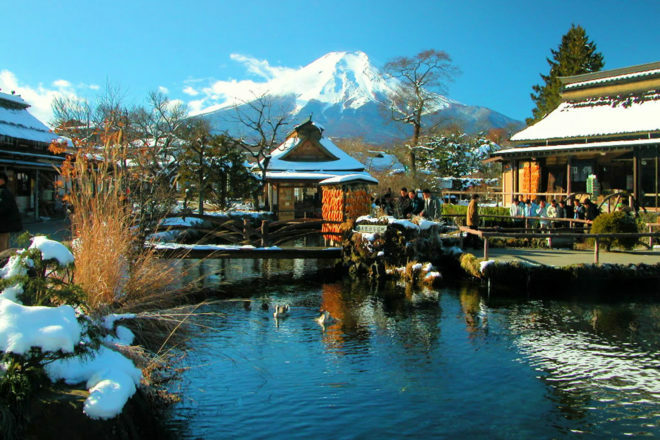 Nexus holidays’ 10-day Japan Snow Package includes the best of the snow and the city. The first two jam-packed days include sightseeing within the greater Tokyo region. Catch a glimpse of Mt Fuji as you sail on a Lake Ashi cruise, and head to downtown Tokyo to discover the vibrant contrast of traditional culture and modern technology as you visit Meiji Shrine, Asakusa Kannon Temple and Tokyo Tower. Later, stop by the beautiful Tokyo Bay area of Daiba City, a shopping mecca of the latest goods and gadgets. Sightseeing complete, you can grab some skis and spiral down the snow-covered slopes of Hakuba. After a day at the snowfields, indulge in some delicious authentic Japanese cuisine, swing by a Japanese-style bar (izakaya), or relax in an outdoor hot spring bath under a breathtaking sky full of stars. Take comfort in knowing that your international flights, accommodation, most meals, coach transportation, English-speaking tour guide and plenty more are inclusive in this outstanding package.